We Plan. We Train. We Analyse. SMART Coaching™ (Established Since 2012) is to give you a clear direction towards achieving your goal. Achieving running goals is not a quick process. Despite a well thought out plan, if you don’t stick to it, you will likely fail. By doing it the SMART way, you can keep track of your running progress toward a specific goal which will motivate you to achieve the ultimate and realistic result. 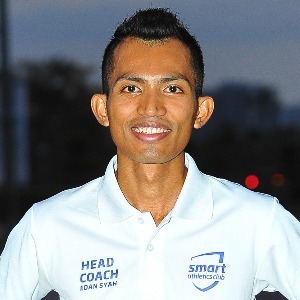 Coach Edan Syah is the Smart Athletics Malaysia Head Coach and has vast experience in Heart Rate Training Concept and Principles. He is the founder of Smart Coaching Established since 2012. He is a 2:30 Marathoner and the 2016 Malaysia's Fastest Marathoner. He has completed Boston Marathon two times (2015 & 2017) and the First Malaysian to complete the All 6 World Marathon Majors (Tokyo, London, Boston, Berlin, New York & Chicago) under 2:55 hours. As a self-coached athlete since 2008, he has been a strong advocate and living proof of Smart Heart Rate-based Training effectiveness. He is a Certified Running Technique Specialist from Romanov Academy of Sports Science, Miami USA, Certified Coach Of RUNFIT/Revolution Running Certification from USA and a Certified Level 1 Coach from National Sports Council Malaysia. With his passion and friendly training approach to help the running community to succeed in running, he has trained more than 600 runners; normal working adults since 2012, from different running backgrounds and age who has experienced and seen improvements in their running capabilities with the SMART Coaching™. It is a privilege to train under him who is still training and progressing to improve himself to be a performance athlete. I only accept athlete with Heart Rate Monitor and athlete must be the Smart Athletics Club Members. Success. Coach EDAN SYAH has been notified of your message.